The Constitution provided for a seat of government for the United States, as the new government could not depend upon states for its own security. It did not provide voting rights for those living there. In granting the governing authority to Congress, the Constitution made no provision whatever for residents of a district created pursuant to clause 17 to vote for any official in any election. With the constitutional authorization, Maryland and Virginia offered land to the federal government for its permanent home. In 1790, Congress delegated to President Washington the authority to choose a site along the Potomac River and he made his choice in January, 1791. At that time there were fewer than 5,000 residents of the area and it was believed it would be a governmental center without a significant population. As a result, little consideration was given to issues of voting for the residents. Congress has dominated the government of the city of Washington and the District of Columbia since the district was created. In the 1820s Congress allowed citizens of the district to vote for a mayor and city council. A territorial form of government for the district was created in 1871. The president appointed all the district officials. In 1874 Congress reestablished direct control over the city government. District residents were denied all rights to vote from the 1870’s until 1961. Residents paid federal and local taxes and were drafted into the military, but for nearly ninety years they had no vote on any issue, either locally or nationally. 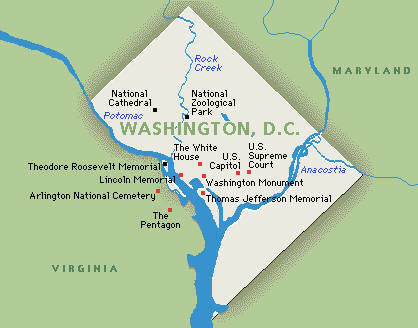 By 1960, the population of Washington, DC had grown to 760,000 residents, more than the population of 13 states. While the absence of voting rights for this many people was at odds with the country’s principles, politics stood in the way. It was expected that if the District were to vote it would be reliably Democratic. On March 29, 1961 with the ratifications of Kansas and Ohio, the Twenty-Third Amendment became part of the Constitution. The Amendment gave the residents of Washington, DC the right to choose three members of the Electoral College. These individuals would have a say in choosing the President. As expected the District has been reliably Democratic, and in every election since 1964, the District’s three electoral have gone to the Democratic presidential candidate. In 1971 Congress granted the residents the ability to send a non-voting member to the House of Representatives. This individual participates in House committees, but has no vote on final legislation. In 1975, local self-rule allowed the residents to choose their own mayor and city council.